You must make reservations at least 5 minutes in advance of the time at 4 Eagle Ranch. Free Parking! Large parking lot on the ranch premises. A professional solo guitarist provides entertainment throughout the evening. Music selections are eclectic; country western, popular, classic. PLEASE NOTE! 4 Eagle Ranch requires a credit card to hold and confirm this reservation. A non-refundable $20/pp deposit will be taken at the time of reservation. Cancellations must be made 48 hours in advance or client will be charged for the full amount. Transportation is available ($30/seat), but is LIMITED. We had a wonderful evening at 4 Eagle Ranch and would highly recommend it to our friends. 4 Eagle Ranch is fantastic! Great food, music and sleigh/wagon rides! I great end to our spring break trip to CO. All of the staff were wonderful. A MUST DO! Food, ambiance, music... all incredible. My two boys can't stop talking about it! The folks at 4Eagle Couldn’t have been nicer! We had a family birthday sleigh ride and meal and everything was fantastic. The ambiance at the ranch is very cool, the live music was great and the food was all you can eat goodness! Family ski vacation to Vail with our grown children and their significant others. This was an amazingly authentic experience, the sleigh ride was short but incredible scenery made it seem much longer. The food and ambiance were just spectacular. I will recommend this to anyone I know of going to the Vail area. This was probably our favorite family experience while in Colorado (visiting from KC). The entire staff was so friendly and welcoming, offering to take photos, playing songs for our kids, even offering a second sleigh ride. The food was absolutely delicious and homemade. Couldn’t possibly recommend it more. Everything was beautiful. Service is excellent and the music great! This was an outstanding experience!! We loved everything about it!! Everyone should do this!! I cannot say enough about the stellar experience we had with 4 Eagle Ranch! From JP who picked us up to the lady in the Trading Post. We loved it all and that is unanimous for our family of six! It was a 5 star experience. Our 7year old granddaughter sang with your guitar player, the sleigh ride was magical, the dining room warm and inviting the food was excellent and the staff VERY turned in to its guests. We love the fact that you are a non profit and the rich history of your establishment! Topping the night off with s’mores for the kids and a second sleigh ride was a grand finale to our Magiccal winter vacation. Thank you for making it everything we hoped for! Everyone was great from the moment we arrived until we left. The sleigh ride was so much fun - we opted for the first one so we could see the silhouettes in the sunset. The food was fantastic & the entertainment delightful. They are extremely family friendly. If you want to get a flavor of the Old West, this is the place to go! We scheduled a wine tasting with Patrick at 4:30 before the dinner/sleigh ride at 6 pm for our family. We had a wonderful time visiting with Patrick and learning about the wines and how they are bottled. We each purchased a couple of bottles of wines and a couple of aerators. We just walked over to the dinning hall right on time for appetizers before our first sleigh ride. They had blankets for us on the sleigh ride and we had a hot chocolate or spiced cider to take with us to keep us warm! Our guide was informative, entertaining and answered all of our questions. We returned for a delicious dinner and great music. We were encouraged to take another sleigh ride after dinner and it was snowing this time! Next we enjoyed more music, singing and dessert! It was just the best experience! We had a party of 26 (we were celebrating my husbands retirement) at the 4 Eagle Ranch for their sleigh ride dinner. Our group had adults as well as 2 year old children. This venue was perfect for a large party! We all had a wonderful time - the live entertainment was great and engaged just about everyone in the room, and service, food, atmosphere, and sleigh ride (a little underwhelming - kids enjoyed it) were very good. It is a little pricey but worth it. I would highly recommend dinner at the 4 Eagle Ranch! This was a great place to enjoy an evening, a sleigh ride under the stars and cuddling with my hubby to keep warm. There was great music all through the evening. The sleigh ride was nice but kids plates are $50 and adults $85. My kid ate rolls and a 3 bites of chicken. He is a picky eater but I just don't see the value for adults or kids at these price levels. Brent, thank you for your feedback, I'm glad your family enjoyed the sleigh ride. I understand your frustration w/a picky eater, which is why we offer "kid friendly" options; mac n cheese/steak/chicken/ribs, a professional guitarist, horse drawn sleigh/teamsters, staff & operation costs. As a non profit we strive to offer a great value for families coming to the Vail Valley. Thank you again for writing & visiting. This was the best experience of our entire trip! Seriously so unforgettable! The staff made you feel like family. The music was better than any live music I’ve ever seen. It was the perfect night! Do yourself a favor and support this place. They do a lot of work supporting veterans. All around special place! Really fun night with beautiful view of the stars. We worried it would be a little cheesy but it wasn't at all -really fun, beautiful sleigh ride, great food. This was a fun evening, highlighted by a couple of sleigh rides under the stars. The service was the friendliest and most helpful I've experienced in a long time -- both in person and on the phone. (Among other things, they were very willing to accommodate my wife's celiac condition.) I'm hard to impress when it comes to food. We got one overdone steak (but of course it's all you can eat and so we just went back and got another), and the salad was mediocre. The ribs were good. But it's a family kind of place and the food was good enough not to detract much. The guitarist plays a lot of classic folk and rock, and a little bit of country. At first it was loud enough that it was hard to have a conversation, but we asked them to turn it down a bit and they did. It was so cold that the s'mores almost weren't able to melt! Finally, they say the GPS may mislead you, but Google Maps got us there with no problem. Wonderful evening! Beautiful sleigh ride under the gorgeous starry sky. Great music playing too! 4 Eagle Ranch did an awesome job hosting New Year’s Eve! My family and I were impressed with the ambience, food, and service they provided. It was absolutely amazing and we plan to make this a New Year’s Eve tradition. Terrific food, beautiful setting, lovely hosts- and great music! A perfect family New Year’s Eve! Fantastic way to spend new years eve. The sleigh ride was awesome, food was delicious, atmosphere was exactly what we were hoping for. Food was excellent. Place is over priced and not a good value. Needs better food for the price. $400 for 4 guests and cheap cafeteria food. Loved this place, it was a beautiful experience. A little overpriced but for a good cause! Awesome, 2nd time there with family, and will be back again! This is a great place for kids sleigh ride was great. However on the table ours wiggled back and forth very bad fixed with cardboard box. Potatoe soup was missing potstoes. Food was basic buffet drinks served in paper cups yet the price of 85 a head. The s’mores marshmallows were frozen shut. SteAk was so chewy my kid couldn’t finish. 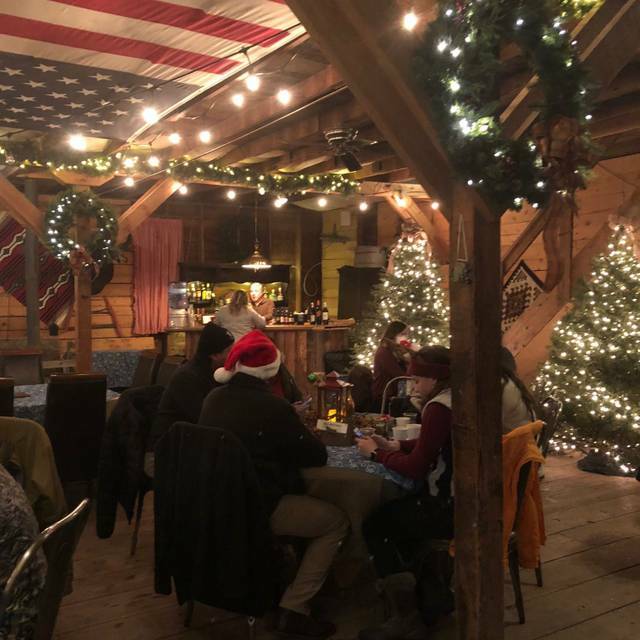 We had a wonderful evening in a cozy and inviting ranch-style environment. The food and music were good (especially the chili), and the hospitality was great. My family enjoyed the sleigh rides as well as the beautiful festive surroundings. Most of all, we were glad to know that this is a not-for profit organization that does this to help the community. It was certainly worth the trip to this ranch! Wonderful night! 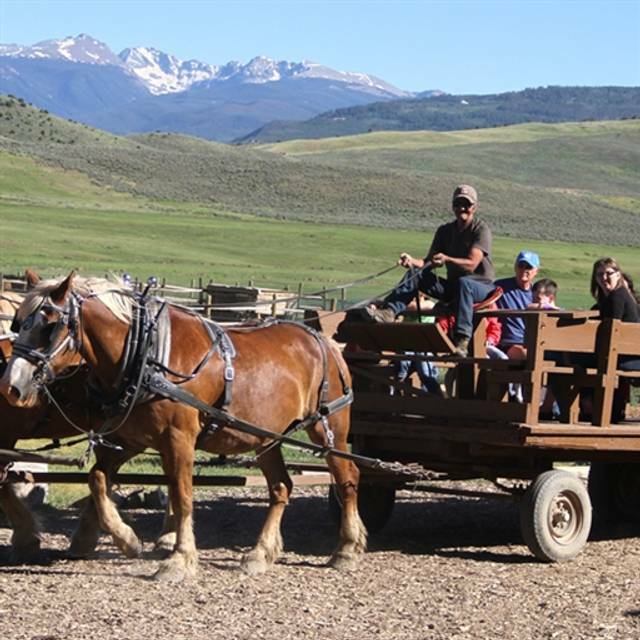 Our family really enjoyed the horse drawn sleigh ride and all the ranch employees are so friendly & welcoming. LOVE it here! Best place ever to take friends and family for a great night. Awesome atmosphere- good food- good music- fun sleigh rides- nice people- great s’mores. I can not recommend it highly enough and I have already gone twice this season!! We really enjoyed our sleigh ride, food and music. To highlight their service, my husband left his ski gloves in their shuttle van by accident. They made the 20 minute drive back to return them to him and we really appreciated that. Such a fun experience! Loved how warm and welcoming everyone was and the authentic ranch feel was exactly what we were hoping for. Sleigh ride with two gorgeous horses was perfect for a two year old and the casual laid back vibe overall in the former sheep barn/log cabin style building was just what we needed for our last night in the mountains! Amazing experience! Would definitely go again. My kids loved it. My family went for the sleigh ride dinner. The food was great! All the employees were very friendly. Great historic venue with live music. The star light sleigh ride was one of the highlights of the evening. We had an incredible experience on our sleigh ride dinner. We will definitely be making this an annual event for our family! The dinner sleigh ride experience is a great time. The sleigh ride isn’t very long but fits well with the schedule of the evening. The food is tasty and appropriate, the location is great, and the staff is outstanding. 4Eagle was wonderful! We had the best time gathering with our friends. The staff is extremely friendly and so welcoming. We had a large group and they handled us all with ease. The ambiance is perfect and Randall the guitar player is a special touch. 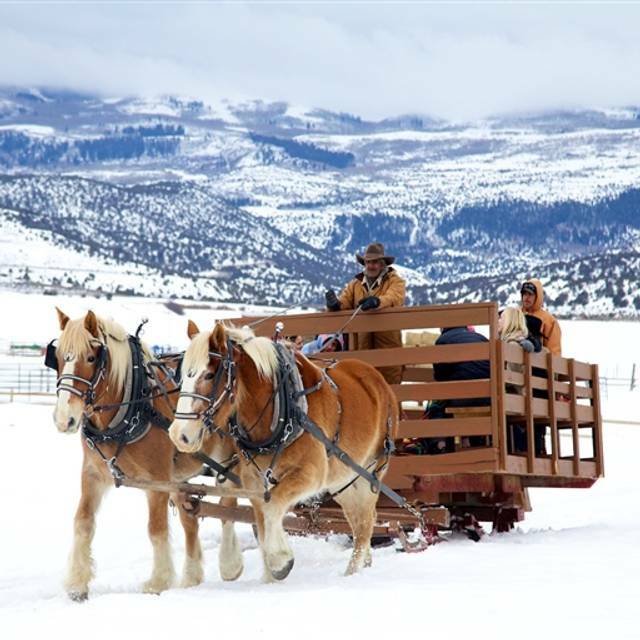 We have tried other sleigh ride/dinner venues but this is our new favorite! Thank you 4Eagle Ranch! Our evening with you was the best night of our trip! We plan to be back next year. Excellent experience at a fun local place! We loved the atmosphere and the whole experience with our children and another family. We would definitely return. We loved it!